Fantastic piece of kit. Having owned some of the high spec models in the range, this much smaller scanner actually impresses me much more. It's quick and compact and in my opinion actually performs a better job than it's more costly counter parts. Being able to be powered via USB is a great benefit. We frequently have to make site visits with clients. This provides us with the ultimate tool to capture the information we need. 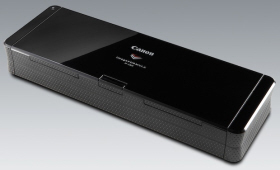 I bought the Canon P-150M as I wanted a high quality, portable scanner which worked with PCs and Macs and linked directly to Evernote. The scanner excels on all of these fronts. The excellent software is easy to use on both the Mac and the PC and the scanner gives superb results. The ability to have duplex scanning on such a compact scanner is a real bonus. I also like the function which enables the scanner to ignore blank pages hence avoiding the need to keep changing the settings for 1 sided scans. I would highly recommend this scanner and am thinking of buying a second one for my wife. I bought this scanner so as I could scan documentation at clients' premises as an alternative to hogging the photocopier. It does an excellent job and the supplied software is intuitive to use. The industry's most compact and portable A4 duplex scanner - Now available for Mac! With a light chassis and ultra-compact footprint, the P-150M is ideal for both the small office and home office where space is at a premium – and for mobile executives needing to scan documents while on the move. The P-150M saves users time and helps them do more: simultaneously scanning both sides of a document at up to 15ppm; and featuring a class-leading 20-sheet automatic document feeder for speedy batch scanning. The P-150M's tiny footprint and stylish design means it's equally at home in a SOHO environment. Our CaptureOnTouch software also makes it so simple for everyone to scan. No other scanner fits so neatly into a briefcase, or laptop bag, and USB-based power up means that users don't have to carry an AC adapter either. Simply plug the P-150M into your laptop and start scanning. Built-in CaptureOnTouch lite software also lets mobile executives scan from other people's PCs without installing an intrusive driver or new application. With USB Power and low 5W power draw, the P-150M is an environmentally-friendly choice. It easily meets ENERGY STAR compliance for energy efficiency and requiring less energy costs less to run. A contemporary polished black-silk finish ensures that the P-150M is a great looking investment.